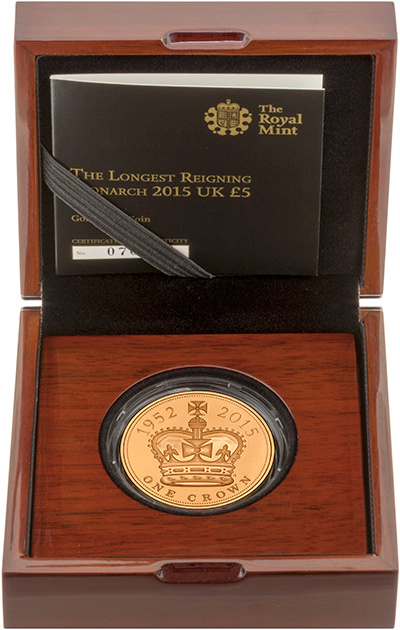 In 2015, The Royal Mint issued a commemorative gold £5 crown to celebrate Queen Elizabeth II becoming the longest reigining monarch. When compared to the Royal Mint price of £1,650.00 you will make a saving of £100.00 per item when ordering from us. During the late hours of 9th September, 2015, Queen Elizabeth II became the longest reigning British head of state. The title was previously held by Queen Victoria, who reigned for 63 years and 216 days. 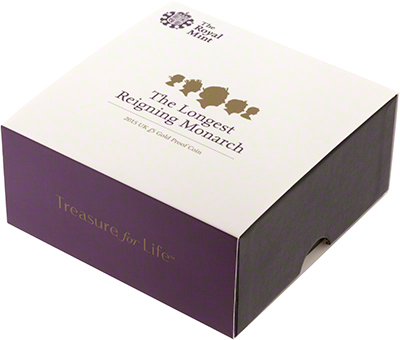 This makes Queen Elizabeth not only the longest reigning British monarch, but the longest reigning female monarch. Celebrations for the event were held on 10th September, 2015. Both the obverse and reverse designs were created by James Butler, designer of The Queen's Great Seal of the Realm. 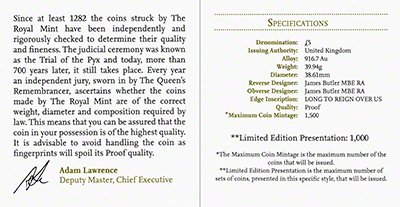 Unlike other 2015 crowns (which feature either the Queen's fourth portrait by Ian Rank Broadley or the new fifth portrait, by Jody Clark) this coin has a special commemorative design on the obverse. It shows the Queen wearing the King George IV State Diadem which she wore on her coronation day, on her way into Westminster Abbey. She changed into the St. Edward's Crown at the altar. Fittingly, the reverse shows the Coronation Crown (St. Edward's Crown). The coin comes presented in a box with a colourful booklet. 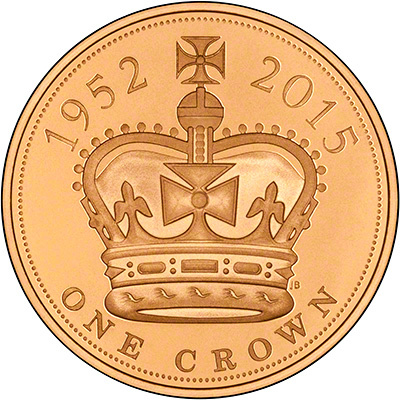 There is a historical difference between gold crowns and gold five pound coins. Crowns were originally five shillings pieces worth a quarter of a pound. Five pound coins, as their name suggests, have a face value of five pounds. The first British crowns were gold coins issued in 1544, and the first silver crowns were issued in 1551. It was not until 1990 that the Royal Mint re-tariffed the crown - which was by then a silvery coloured cupro-nickel coin - from five shillings, to five pounds. 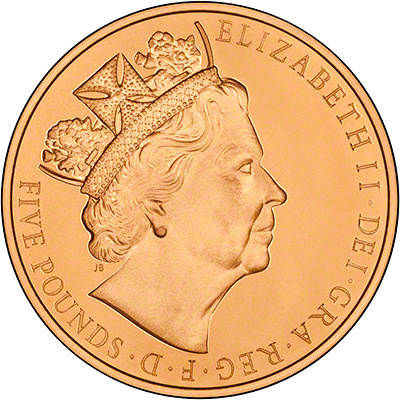 The obverse is a commemorative portrait of the Queen by James Butler. The reverse features the Coronation Crown. We received our first delivery on 24th September, 2015. We have sold out of those coins but have more on order. We expect them to be with us shortly. 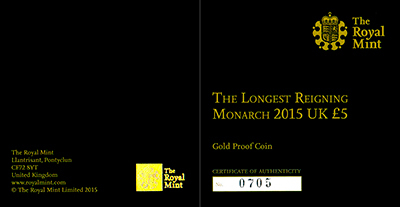 The Perth Mint also have longest reigning monach coins, available in 1/4oz and 2oz gold, as well as 1oz silver.